A new eatery has opened on the fringe of Borough Market, Southwark’s most eclectic culinary hotspot. Folded inside a narrow railway arch, El Pastór offers a contemporary twist on a traditional taqueria, serving spicy tacos, quesadillas, tostadas and aguachiles from an open kitchen not much larger than a street food cart. Acclaimed proprietors the Hart Brothers (of Barrafina fame) enlisted the help of Michaelis Boyd Associates to dress and shape the intimate space. They’ve kept things refreshingly raw and simple, so as to highlight the location’s existing features - most prominently, the atmospheric curved ceiling. 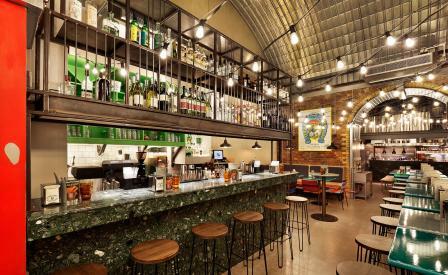 Choice new additions from the designers include an emerald green conglomerate marble bar, repurposed stainless steel window frames, and a lighting design best described as a fiesta of fairylights. Fiery small plates pile onto Pyrolave tabletops, of which the chargrilled stonebass and pineapple taco is a particular hit. To whit, a drinks menu boasts multiple mezcal choices. The smoother, smokier cousin of tequila is served in carafes and sipped from hardened pomegranate shells, sweetened by hefty wedges of blood orange. The no-booking policy often sees a healthy line of customers snaking through the covered market outside, but with the promise of Mexican warmth and bottomless Mezcal ebbing from El Pastór’s shutter-shopfront, who’s complaining?